Whereas in Wonder Woman: Bitter Rivals, Greg Rucka focused mainly on earth-bound politics (well, excluding Circe and a couple of Gorgons), in Eyes of the Gorgon the gods are back in full force. Rucka's done a fantastic job of creating a supporting cast for Wonder Woman that moves and breathes like that of the best television one-hour dramas, and indeed, as I've mentioned before, fans of the late, lamented West Wing or the political comic Ex Machina should find much to love in Rucka's Wonder Woman trades. But most interestingly, perhaps, is the pattern of violence that begins to emerge as Rucka's Wonder Woman stories continue, as we watch for signs of what will ultimately lead to the Superman/Wonder Woman fall-out. Medousa has been resurrected, and with advice from the witch Circe, plots to take revenge for her own murder at the hands of Athena's previous champion, Perseus, by defeating Athena's new hero -- Wonder Woman. The Gorgon teams with Veronica Cale -- who's been busy causing political trouble for Wonder Woman -- first attacking the Themiscarian embassy, and later challenging Wonder Woman to a gladiator-type duel in the modern-day Colosseum, Yankee Stadium. Wonder Woman is victorious, though not without great personal cost, and as she despairs for all her recent losses, she must at the same time re-prove herself to her JLA comrades. Meanwhile, Athena plots to overthrow Zeus's reign on Mount Olympus, drawing Wonder Woman into the fray, and the United States military converges on an increasingly isolationist Themyscara. Rucka very subtly suggests the burden that Wonder Woman feels from the amount she's lost over the course of her title's two-hundred plus issues. Even as moments of levity shine through in the story, Rucka's run on Wonder Woman can essentially be seen as the story of Wonder Woman overcoming depression. 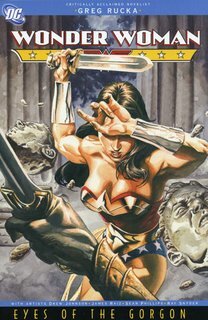 Rucka does well acknowledging Wonder Woman elements from other writers' runs, including the Lanatharian, the Silver Swan, and Circe's Donna Milton persona, but he also recognizes authentically how the deaths of Hippolyta, Donna Troy, and Trevor Barnes would all affect Diana. After Medousa causes yet another death at the Embassy, Diana's desire for vengeance comes swiftly, suggesting that it's been building for a while. That Rucka's run fits so naturally with what came before only deepens the reader's enjoyment. And I especially liked how Rucka wisely kept silent Diana's wish to Athena in the end; only the most cynical among us would think she asked for her eyesight back, rather than the lives of her loved ones. One of the great obstacles for readers of previous Wonder Woman series, I think, has been the presence of the Greek gods. Despite a volume of comics stalwarts -- George Perez, John Byrne, and Phil Jimenez, to name a few -- nearly none have been able to portray the gods as highly interesting, nor have they been able to distill the gigantic Greek mythos into easily digestible form. I don't advocate any dumbing down of comics -- quite the opposite -- but to be honest, when the sheer delight of the superhero genre rests on super-powered beings in bright costumes blasting one another across skyscrapers, having the Greek gods come down veritably deus ex machina, spouting "thee's" and "thou's" as they go, has always seemed to me to drag Wonder Woman stories down. How revolutionary, then, for Greg Rucka to stick Athena in khakis, Ares in leather, and Aphrodite in ... not much at all, and let them take on the modern sensibilities that the stories cry out for. The plotting and backstabbing among the gods is as old as the Odyssey, but the fresh take on them that Rucka injects is sheer brilliance, if only coming far too late, at the end of this Wonder Woman run. At the same time, the machinations of the Greek gods were at times almost too complex for me. Athena's moves from the background to the foreground of the story almost too quickly, and it was difficult for me to always follow her schemes -- she didn't free Medousa, I think, but she did capitalize on Medousa's battle with Wonder Woman in order to gain Medousa's head. For a while, however, it seemed that Athena was working with Ares -- and even, she states, "Hades has a role to play" -- but at the end of the trade, it seems that Hades and Ares have turned against her. I wasn't sure, perhaps, whether Athena's plan remained in motion, and she expected Ares to defect, or whether this was something new; in addition, I'm not quite sure what she whispered to Wonder Woman to make Wonder Woman fight to defeat Zeus. I did, however, like the parallel of Wonder Woman proving herself both to the JLA and the gods; the latter supports her, while the former does not. Given Wonder Woman's already-fragile state of mind, it remains to be seen if her time with the gods will make her feel too "holier than thou" as she takes matters into her own hands in Superman: Sacrifice. So this is, not surprisingly, another good trade in Rucka's Wonder Woman run. I'm next to read Chuck Austen's duo of Superman trades (in which I read the other day, surprisingly, that the J.D. Finn issues were not apparently written by Austen), and then on two Greg Rucka's pre-Countdown Adventures of Superman duo. See you then! Great book. I also like how most of the Greek gods are dressed in more modern clothes, not just because they showed how they've adapted to a changing world, but also because they showed how much Zeus didn't. He's the only god who's stuck in his ways, and that's why he had to go.